Standing 6 feet 5 and weighing over 300 pounds, Sugaray Rayford is an imposing figure and a born entertainer. Over recent years he has made some excellent records with The Mannish Boys and solo but this disc is arguably his best yet. The core band here is Sugaray on vocals with Rick Holmstrom or Eamon Ryland on guitar, Sasha Smith on keys, Matt Tecu on drums and Taras Prodaniuk on bass. The horn section from The Late Show With Conan O’Brien (Ron Dziubla on sax, Mark Pender on trumpet, Richard ‘La Bamba’ Rosenberg on trombone) appears on five tracks and two further tracks feature Mark paired with sax player David Ralicke. Producer and Forty Below boss Eric Corne adds harp to three tracks and B/V’s, percussion and acoustic guitar throughout; strings appear on two tracks with Eric Gorfain on violin and Richard Dodd on cello; Roberta Freeman and Carol Hatchett add backing vocals on several tracks and a choir of Brittany Gael Vaughan, Brittney S Wheeler, Terika Jefferson, J-Blake White and Gabriel M Newman appears on one track. All the songs were written by Eric Corne and seem to have been crafted to fit Sugaray’s personality and vocal talents. 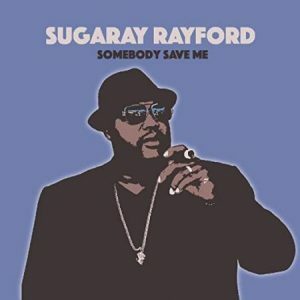 “The Revelator” is a fascinating opener with Taras’ hypnotic bass line and Rick’s echoey guitar underneath Sugaray’s commanding vocal, one part preacher, one part seducer. The song builds in intensity and Mark’s jazz-tinged trumpet fills the solo slot, choir and strings adding to the depth of the arrangement. In contrast “Time To Get Movin’” is an invitation to change things with a frenetic beat aimed at the dance floor with pumping piano and a short harp feature. There are then two soul tunes, both with excellent horn arrangements: “You And I” has that Stax/Memphis swagger from the horns (or is it New Jersey as Mark and La Bamba are both veterans of Southside Johnny & The Asbury Jukes? ), combined well with a romantic lyric and a beautifully poised solo by Rick; “My Cards Are On The Table” is a soul ballad with sensitive lyrics: “I’d wage bloody battle just to hear you call my name. My cards are on the table, take my hand because I’m ready and able to be your man. Come on, baby, I’ve waited my whole life for you. So come on baby, I’ll always be true.” These two songs are real highlights of the album. Eamon’s slide and Eric’s harp give “I’d Kill For You, Honey” a Mississippi feel and Sugaray’s vocal gets down and dirty in response and the brooding “Angels And Devils” finds the singer in fine form on a song made more mysterious by the ‘creepy’ organ work. The lengthy title “Sometimes You Get The Bear (And Sometimes The Bear Gets You)” has a catchy core riff that in parts reminded this reviewer of “Crosscut Saw”, especially when Rick cuts loose on guitar, well supported by the horn section. The sweeping strings introduce the title track, another soulful ballad in which Sugaray is seeking salvation not from above but from someone who will fill the hole in his heart – a lovely ballad with a fine vocal performance. The horns push the energetic “Is It Just Me”, a dance floor filler with a Motown feel – try sitting still to this one! The final song is “Dark Night Of The Soul”, all moody atmosphere and full-throated anguish from Sugaray, Eric’s eerie harp on the outro perfectly matching the mood of the song. With some albums repeated listening results in one’s enjoyment diminishing – not in this case! As you listen again you hear more of the band’s excellent work, every instrument clear in the mix, all credit to Eric’s studio skills. Sugaray’s voice is front and center on songs that suit him well, backed by a strong set of musicians, so this one comes highly recommended!